Whatever, what I didn't know is that Deborah would bring me again to this small village to visit a friend of hers who makes wine there : Kelley Fox. What I didn't know either was that Kelley was making wine precisely in one of these old grain storage silos which had took my eye when we drove through the first time (pic on left, the tall, white construction), reminding me other such silos spotted in small anonymous communities like this one in Ogallalla, Nebraska. That was indeed a good omen for this unexpected visit. The facility The other interesting thing is that Kelley Fox is actually making wine under the roof of another winery, namely Scott Paul Wines, who own this former agriculture industry building and had it renovated to turn it into a winery facility. 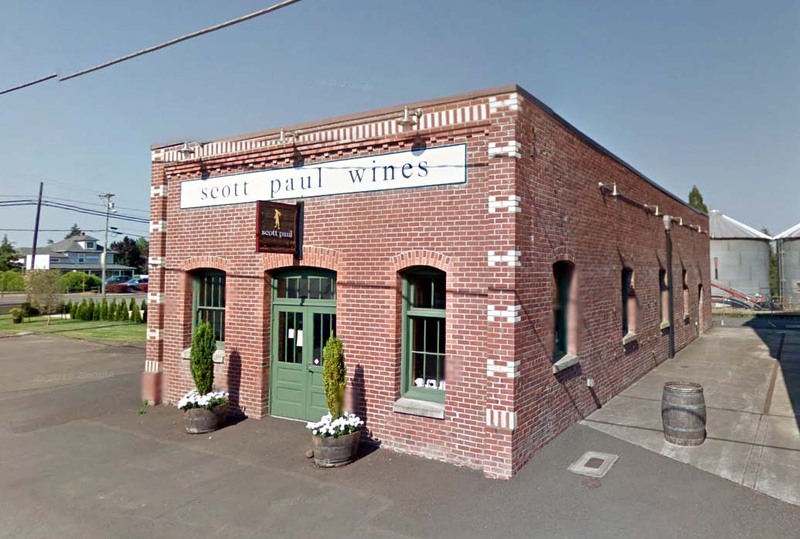 Scott Paul is a fairly recent winery (1999) focused on pinot noir and the owners Martha and Scott Wright who initially come from LA also set up an import business focused on Burgundy and Champagne wines, which is quite unusual for a winery. Before telling more about Kelley, I must say a few words about this beautiful renovation : using such a building to make a winery wouldn't have crossed the mind of ordinary winery owners, it was very dirty, unisnsulated and too high to make an efficient winery, at least that's what most investors would have said, but the owners of Scott Paul saw it another way, it was right downtown, an easy access from the brick building on the other side of the street where they sell their wines (itself a former creamery, see picture). Plus it's so much better to give another breath of life to abandonned industrial buildings who are part of the landscape than to build yet another facility in the suburb. In front of a fermenter Kelley fox has been making wine for nearly 15 years, working in different wineries including Eyrie and she's been working as a winemaker for Scott Paul since 2005. As such, she was the main contractor regarding the renovation and selection of fittings in this former chicken barn (or a grain storage silo I'm not sure what it was actually). She now also makes her own wines here along with keeping consulting for Scott Paul, and this visit is focused on her own line of wines. Kelley Fox spent several years in Europe when her father was appointed there (particularly in The Hague), and wine was part of the daily life there. she later was a student in Texas then in Oregon State U at Corvallis Oregon, where we followed another cursus (biochemistry), and after these 8 years spent studying she happened to meet someone who was planting a vineyard next to Bradly Vineyards in Oregon, and she found herself overnight drinking routinely beautiful Bradley pinots from 1992 and it was so delicious, gradually, she put her hand at it, in the vineyard and the chai, did a couple of harvests and finally, encouraged by her partner, decided to make wine herself. She first worked full time for Torii Mor in 2000 and she never stopped making wine since then. Asked if her biochemistry expertise helped, she says it helped not use it, she says she understands that she knows very little about life, that wine is changing, is moving, it has countless forces of equilibrium and if you do something in one direction, all the other ones change, so it helped her not interfere as much as possible during the vinification process. It also helped her not being excited by all the new tools that are being shown to them every year by the laboratories, like enzymes and other additives. Thinking a second, she says that she feels this way because it's fitting with her whole life. She always felt close from nature and used routinely medicinal herbs rather than medicine, so wine had an appeal in that regard. She is doing biodynamic preps herself lik the 500, silica, using a well polished stick that she got at Marsh Vineyard and that she keeps preciously. She also uses the well water at Marsh for the biodynamic preparations. Tasting from the cask Her time working with David Lett at Eyrie counted much for here (see pic of here with David on right) and she says that she thinks to him everyday and while not saying she wants to take his mission, she feels somehow that there's something she received from him that she want to develop to the end, although she doesn't know what it is exactly. Her winemaking is pretty simple, she doesn't inoculate (with lab yeast), she does her fermentations in one-and-a-half-ton fermenters (2nd pic above). The acoustics here is quite good she says and at harvest she puts a stereo with music, from composers like Rachmaninov, Gabriel Fauré and Chopin for example. She doesn't advertise this, she just does it because it feels good. Speaking of the fermentation, she says she doesn't use a starter or pied de cuve, it's all spontaneous fermentation in the juice and grapes. She makes only reds. The grapes are all picked by hand from the equivalent of a one-acre surface at the Maresh vineyard (she doesn't do it herself) and come by quarter-ton bins in the facility. Then they do some hand sorting. Part of the grapes are destemmed, she keeps from 30 % to 50 % of them whole-clustered because it's easier. She doesn't particularly make layers of destemmed and wholeclustered grapes, she is not too directive in her winemaking. The fermentation bins keep the temperature beautifully and are very easy to move around with a pallet jack (see pic on left, shot during harvest). She has typically several fermenters near each other and she can do the pigeage by sitting atop of it, then turn around and check the next bin. She's doing her own wine all the while doing the vinification of Scott Paul's wines, in this same building, so it's very convenient. She checks every morning the sugar and she tastes, and when it's dry she takes the free-run juice off, settles it and press the grapes, settling the two juices separately. Last year she made 25 barrels of wine, but her wines are made from different parcels, and she keeps blocks separated. Kelley pouring her Pinot Noir There are only two things that she may ad in the wine, and only in a very hot year or in a very cold year : in a very very hot year she'll add grape-derived tartaric acid, and in a very very cool year, sugar. She says that without making sterile, factory wines, one has to make wines that are sound and aromaticly pleasant. Some people who drink natural wines sometimes become suspicious when they come across a wine that has "not enough" reduction or has tannins that go smoothly, and they become suspicious, but her purpose is make a little-intervention wine that drinks well. __ Kelley Fox Pinot Noir 2012, Maresh vineyards (from a cask). Block 8, Pommard, planted in 1978. She's been working with this block in 2009 and wether because of the biodynamic sprayings or other things, it's been improving all along. This is going into her cuvée Mirabai. It will be bottled a month after picking for space reasons. She's wondering if she bottles too early as her wines need more time to open compared with her friends'. She has only 2 casks of this but it's shipped to Germany, New York and Chicago. there's only the free run juice here. The wine is still young, with a tannic edge in the mouth. She has some SO2 there just after malolactic, with varying amount depending of the ph, maybe 25 parts here. She's open to experiment a SO2-free vinification when she has a wine with the right acidity and tannins, she says. __ Kelley Fox Pinot Noir 2012, old block (1970). Free run only too. She keeps the press juice for the lower (sort of) Mirabai cuvée (although there's some free run there too). She racks on descending moon days, she bottles on fruit days and samely does her BD spraying on fruit days. But she usually doesn't talk about these details to people, she tries to be inclusive and some people are puzzled by these practices. the wine has a sugary side but it's dry, and Kelley says that the 13,5 ° in alcohol is why there's this light sugar feel. She says that her wines are unpredictable, when she wants to show them, they hide and when she ignore them they're like this (making a magnificent gesture). She tell her customers to please wait a month after shipping before opening the first bottle because the wine will hide after the shipping stress. __ Kelley Fox Pinot Noir 2012, long rows. Planted in 1970 too, not very long after David Lett's plantings of Pinot Noir which were the very first of Northern Oregon (1966). This is dry farmed too (no irrigation) and the place is a real farm, not a big growing business. This parcel is a very long slope and it take her one day to do 2 rows, she's exhausted when she works there but her best wines come from there. Nice character, with acidity and tannins going well together. She says, see, a natural wine hasn't to be dirty, adding with a laugh that it sounds like she is defending herself but it's not the case. Will go well with food I think. She's using screwcaps, she had problems in the past with corks and she says that when you sell a bottle at 50 $ you must be sure that the customer doesn't get a faulty bottle, even if the risk is only 1 %. At Maresh Vineyards Most of the vineyard she works with at Maresh were planted in 1970 on their own roots (ungrafted), and this makes certainly for the quality of the fruit. She's responsible for the farming but doesn't do the tractor, the sprays and the pruning. But she does other work on the vines by herself, like leaf removal and canopy management. The other things are actually made by her ex-husband whom she trusts and who does the vineyard management at Maresh. At Maresh Vineyards when she asked if she could do some organic, biodynamic compost the owner just said no problem, go ahead and she had this big truck dumping organic cow manure all over the place, on top of which which she put the straw and waited months to see what happened, she was very excited. When time came to dig the holes in the ground to put the manure she was surprised to see all this life and worms already in there in the soil, realizing that the soil hadn't waited for her intervention. She says that she know knows what had brought all this life and energy in the soil, it's the love that they have for it. She adds that she knows it sounds crazy to say that, but just loving a vineyard and speaking to it, doing the little things here and there to prove that love turns into energy in the vines and the soil. When she sprays the biodynamic preps, the cow manure, she sings to the vines (probably badly, she jokes) and the owner Jim who lives in the middle of the vineyard sometimes tells here afterwards that he heard her sing to the vines, and she feels a bit ashamed of that, but she likes it and thinks it's important too. She feels that plants can send messages and channel energy to you too, and spending time in the vineyard counts a lot for her now. She doesn't follow fixed rules, like last year they had some bigger clusters In the "Long Rows" She has very good relations with the owner of Maresh, Jim, he's like family for her, he has 5 children, loves to listen to jazz outside near his house with a glmass of pinot. And she makes some wine for them too, that she vinifies and bottles in exchange for grapes, and he sells this wine at the farm's tasting room [the place to go when you don't find any of Kelley's wines left]. There are lots of butterfly around, she recognizes 4 different types although she can't name all. On the side is a field where there'll be honeybee clover and wild flowers for the bees, and that's the way Jim works, she adds. the wooded lot on a side is in a permanent trust, meaning that by law the trees can't be cut, ever. Otherwise, there are hazelnuts and old cherry trees. There is a nesting hawk and two bald eagles too. The earth is red here and there's indeed a reason the estate's full name is Maresh Red Hils Vineyards. When she took over the farming management here she switched from flat cane to ark for the training, to make it the way it was before. With the ark on these old vines you get a little bit extra of vigor and it's good, you have more fruit when before it was inappropriately low tonnage with the flat cane training, it was not just a question of getting more yields. She gets the farmer plow the vines, not deep, just to keep the weeds off. Here is an interview of Rebecca in Forbes.